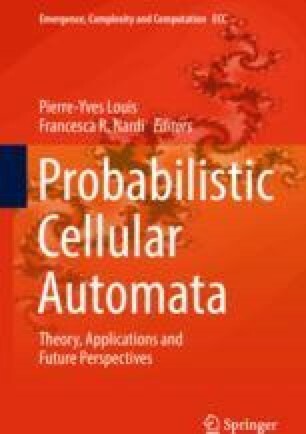 Some deterministic cellular automata have been observed to follow the pattern of the second law of thermodynamics: starting from a partially disordered state, the system evolves towards a state of equilibrium characterized by maximal disorder. This chapter is an exposition of this phenomenon and of a statistical scheme for its explanation. The formulation is in the same vein as Boltzmann’s ideas, but the simple combinatorial set-up offers clarification and hope for generic mathematically rigorous results. Probabilities represent frequencies and subjective interpretations are avoided. Research supported by ERC Advanced Grant 267356-VARIS of Frank den Hollander. I would like to thank Aernout van Enter, Nazim Fatès and Ville Salo for helpful comments and discussions. This article is dedicated with love and appreciation to my teacher Javaad Mesgari.